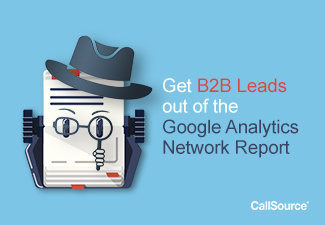 Do you have B2B leads hiding in your Google Analytics Network report? Well, as long as you have website traffic and Google Analytics tracking installed, then you have these hidden leads. But who are they? Where can you to find them? What should you do with them? I’ll be addressing these questions in this post. A few years ago, a sales manager told me that they heard it was possible to scrape B2B leads out of their web traffic. Being the analytics man that I am, I sought to find out how this could be accomplished. I discovered that this information was much easier to find out than I had originally thought. The catch (there’s always a catch, right?) is that you will not get contact information or private information. The CAN-SPAM Act’s laws compliance prohibit scraping an email out of a website and emailing to it beyond a certain time period – it also requires that you ask for the opt-in. At some point, you must delete these leads or remove them from your emailing database if they have not opted in. Why? I never heard of this. Well, to receive your messaging, every single contact in your email or CRM must have opted in or done business with you at some point. This is CAN-SPAM compliance 101. Plus, as a business, you do not want to harass or annoy your potential leads. What I will show you is to help you build better relationships and follow-up on interested businesses. I do not recommend that you abuse or harass people who have viewed your website, remember, they have not opted in to be solicited to. Totally! This is a white hat (legal), and totally appropriate method of identifying your website visitors by their network (which I will show can also be their business). But you don’t have to take my word for it – check out a similar article on Google’s blog for how to locate this same information. I will also show you the appropriate methods you can be using to start the conversation and how to proceed. Should I get B2B leads out of my Google Analytics Network report? Yes, you should. Your competition will – and it’s possible that the only thing keeping those leads from buying your products or services is not confidently knowing if you are the right business to solve or satisfy their need. Give yourself the chance to earn their business – this is just part of doing your due diligence. OK, I want to see where my B2B leads are in my Network report! [ ] Google Analytics is installed and working on my business’ website. If not, install it now and wait a few weeks/months. Then come back here and continue. [ ] Google Analytics is receiving website data from my Business Website. If not, troubleshoot with your web or analytics manager to get it working, wait a few weeks/months, and then come back here to continue. Step 1 – Google Analytics Login. Step 2 – Go to Audience > Technology > Network. Step 3 – Set the date/time period to a recent period (you can extend if this is your first time doing this). Step 4 – Add exclusion networks. You need to remove any networks that are not ideal companies to do business with. For example, AT&T is an internet, phone, and television provider – if that kind of company is not who you do business with, then you need to exclude them and companies like them. And let me tell you – there are so many! If you have a long list, take the time to identify those companies in the list that you do not consider ideal customers in your B2B space. Keep a running list and organize it into a REGEX formatted list. Step 6 – Organize how you see fit. Consider changing this into a Pivot Table or other usable format. It’s also worth considering adding a second dimension to see what specific pages were visited, but this creates only a sampled data set. If you desire a way to see what businesses were more valuable than others, consider filtering by the Pages / Session metric. If not, what information is important to know about these leads before contacting them or deciding whether or not you want to do business with them? If not, what should you do with the information? Is it possible that your marketing or sales is attracting the wrong type of leads to the website? If not, what information should you attempt to procure in order to contact them (email addresses, phone numbers, etc.)? If not, how can you obtain it? What type of information is valuable to know before first contact? If not, consider making something that can be offered during the first conversation. This can go a long way in setting the stage, but carefully consider what you are going to send them. How you handle this type of contact says a lot about your company. You want to start every relationship you can in a good light, but you should also try to obtain as much information as possible in order to establish a better follow up strategy. Remember, these leads most likely have never opted in to anything from your company. You should tread lightly with these and approach them as opportunities that are already sunk. Anything you can do to raise these leads to a better light should be seen as positive. These are technically cold/warm leads, but they have not engaged enough to have given you their information yet. Check your CRM, as mentioned prior, and make sure that you have not followed up with them before. How did the first contact go? Were there gatekeepers before you reached an ideal contact? What paint points did you discover? What solutions from your company were mentioned or suggested during the call? What are the next steps of following up a second time? That is it! You are ready to go find those hidden leads and create your strategy around reaching out and hopefully closing some more deals. Be sure to subscribe to our blog for more insights like these.